I think I am beginning to forget how to blog. For the past week I have been learning how to make toothbrush rugs. The photo shows the rug I am making, the toothbrush tool I made out of a toothbrush handle, and the fabric I am using. The fabric was bought on sale a few years ago to make a top, then I thought better of it, as it is too bright. I think it is making a pretty rug. I bought the toothbrush at the dollar store for 5 for a dollar and shaped it with a dremel tool. I love using a dremel, but that will be another blog post. 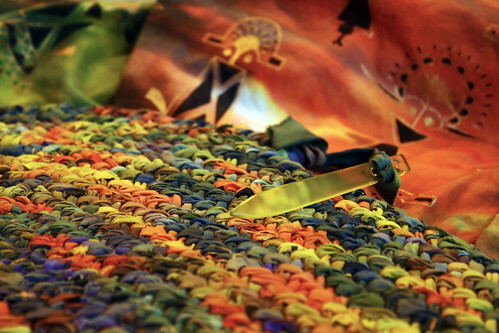 There are so many ways to make a toothpick rug on the internet. The way I like is the one without the runner strip. I think it is referred to as a Swedish technique. It makes a really thick and durable rug because each stitch/loop of fabric is worked 3 times. It took me an hour of play before I really got the hang of it. These are the directions I followed. These directions say to sew the strips together, but I looped them trough a slit like most of the videos on You-tube show. There are a lot of videos, none have all the information. It is nice to have so many different ways to do something, and to pick the ones that make sense to me. The only tip I found out that I didn’t see mentioned is that you need more increases to make the rug lay flat than I would have thought coming from a crochet background. I am doing 10 increases a row, 5 on each side of the oval. Now I don’t feel so bad about some of my sale fabric purchases. Rugs will use up a lot of that fabric. This entry was posted on Tuesday, December 17th, 2013 at 9:19 am and is filed under Needlework, Sewing and Tools. Tagged: Craft, Fabric, Needlework, Sewing. You can feed this entry. You can leave a response, or trackback from your own site. Your rug is looking really nice and happy! Love it! I’ve always loved handmade rugs made from fabric scraps. Happy Holidays!